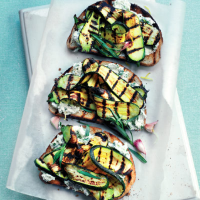 Cooking the courgettes in a griddle or pan on a barbecue gives them a great appearance and flavour. Courgettes are also a good source of essential B vitamins. 1. Toast the bread until lightly browned on both sides. Rub the cut garlic halves over 1 side of each piece of toast. 2. Slice the courgettes lengthways (you should get at least 4 slices from each courgette) and spray lightly with olive oil. Grill or griddle for 4-5 minutes on each side until the courgette is tender. 3. Meanwhile, stir together the ricotta, lemon zest and tarragon and spread thickly over the toast. Add lemon juice to taste. Arrange the courgettes on top, season with black pepper, garnish with tarragon and serve while warm. This recipe was first published in Fri Jul 01 09:32:00 BST 2011.